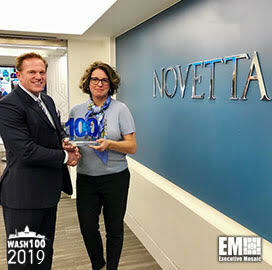 Jim Garrettson, founder and CEO of Executive Mosaic, presented Tiffanny Gates, president and CEO of Novetta, with her first Wash100 Award on Tuesday. Executive Mosaic recognizes Gates for her efforts to increase the company’s workforce by exploring cloud-based platforms, big data and information technology. We are honored to present the most coveted award in government contracting to Tiffanny Gates of Novetta. Gates joined Novetta as the president of the Federal Division in Jan. 2016 and became president and CEO of the company in March 2017. Prior to her current role, she served as the vice president of Raytheon between Nov. 2014 and Jan. 2016 and Blackbird Technologies from Dec. 2010 through Nov. 2014. She also served as the SVP of Strategy and Business Development for ManTech International for over two years and the president of the Emerging Technologies Group USA for seven years. In the U.S. Navy, Gates worked as a cryptologic officer for five years and worked as an advisor to Razor’s Edge Ventures. 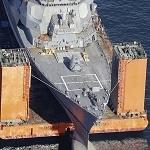 She earned a bachelor of science degree from the United States Naval Academy in 1995.